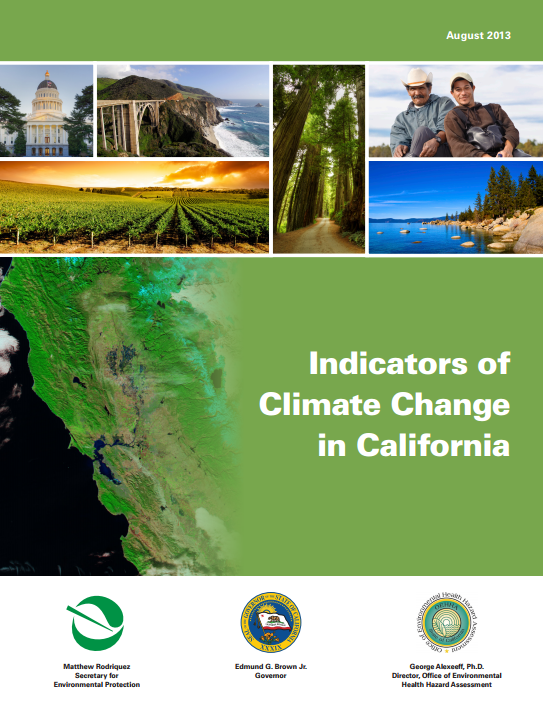 Following up its good news/bad news report on Lake Tahoe, the California Office of Environmental Health Hazard Assessment paints a bleaker picture in its August 2013 Indicators of Climate Change in California. *includes the Sacramento River and major tributaries, the Feather, Yuba and American rivers. Changes in average temperatures have led to die-offs of native vegetation at the lower range of various species’ elevation range (during the last six decades Sierra Nevada conifers have clearly retreated upslope) and is pushing about half of the small mammals in Yosemite National Park to higher elevations. The annual acreage burned by wildfires in the state increased since 1950, with the three largest fire years occurring during the last 10 years. The acidity in the coastal waters around Monterey Bay is increasing at a rate greater than that in the open ocean near Hawaii. The average annual temperature in mountain lakes, including Lake Tahoe, has risen over the last few decades. And butterflies are emerging earlier during the spring in the Central Valley. Yet, there’s no real trend that can be discerned from the data. The rise in the sea level rise along the California coast is bucked the global pattern and has be relatively constant during the last two decades. Categories: California, Conservation, General Discourse, Government, Lake Tahoe, Sierra Nevada, Trout, Tuolumne River | Tags: California, Central Valley, climate change, conservation, forest, Lake Tahoe, Mono Lake, Monterey Bay, Sierra Nevada, trout, Tuolumne River, weather, wildfires, Yosemite | Permalink.